Discount Wholesale Custom House Calendar Magnets with full color imprint. Inexpensive, Promotional. Budget Prices in America. We supply top quality bulk custom house calendar magnets at the lowest prices in the advertising industry. The full color imprint allows easy addition of you color photo at no extra cost: just Email us your photo. Free artwork design. 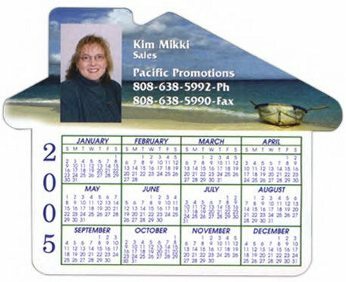 Lowest prices in the USA and Canada for wholesale custom house calendar magnets. American clients pay no taxes. Dimensions : 3 3/4" x 4 11/16"
Standard Material Thickness: Approximately ." (20 mil.). Add only $0.06 per unit for 30 mil. thickness. Unit Prices below include your full color imprint, or your imprint in any number of colors, from 1 to 10. Production Time: 5 days after art approval.